The F-117 Stealth Nighthawk was a truly groundbreaking aircraft when introduced in the early 1980s. The strange shape of the jet, all flat panels and angles, rendered the aircraft nearly invisible to radar. This highly classified program wasn’t acknowledged publicly by the U.S. Air Force until 1988. The Nighthawk was retired in 2008 after twenty-five years of service, including bombing missions over Panama, Iraq during both Gulf Wars, and Yugoslavia during the Kosovo war. Brad O’Connor flew the Nighthawk during the NATO bombing campaign over Kosovo in 1999. His first-person experience puts the reader in the cockpit of this revolutionary combat aircraft. 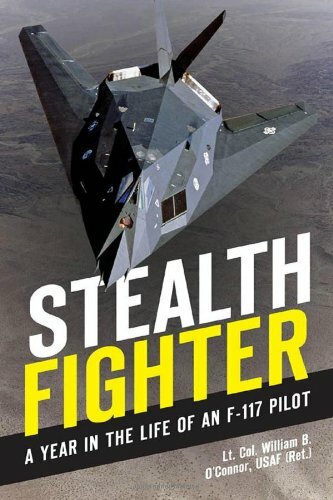 From his F-117 assignment through training, deployment, mission planning, and combat flights, O’Connor relates the day-to-day life of a pilot in the world’s first stealth fighter. 424 pgs, HB w/dust jacket, 6.25x9.25, b/w & color photos.